The L/A Nordiques Hockey Club hosted Kevin Hunter, representative of the Dempsey Center, at a game against the Northeast Generals. The club raised $3,034.50, which was donated to the cancer center. 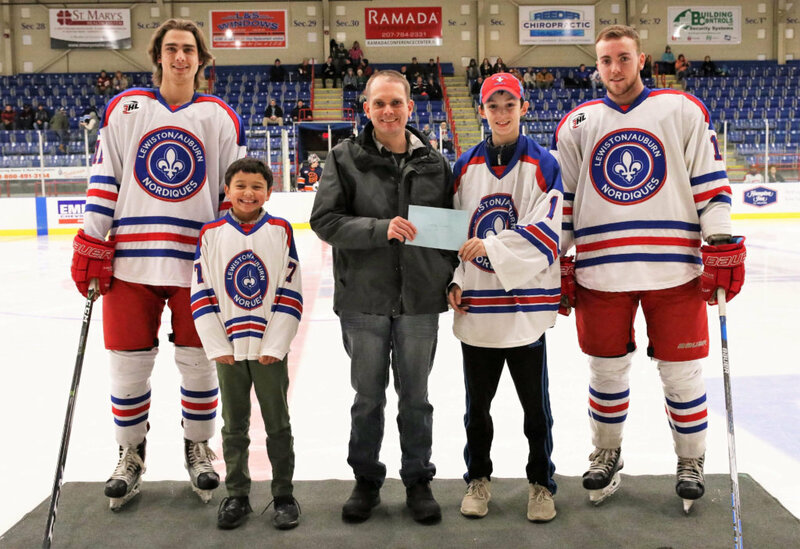 Pictured are NA3HL players, from left, Andrew McCormick and Caleb Labrie along with top youth fundraisers Avery Tyler, left, and Evan Greaton presenting Hunter with the donation. Absent were top youth fundraisers Nolan Heath and Nick LeBrasseur. Earlier this season, the L/A Nordiques Hockey Club’s NA3HL and youth players joined to raise money for the Dempsey Center.